On December 7, a court in Alexandria is scheduled to hear an appeal from fourteen women who were sentenced to 11 years in jail following their participation in a peaceful pro-Morsi demonstration. Another appeal by seven girls who were arrested at the same protest — all of whom are under 18, the youngest of whom is 15 — will be heard by a separate court for juveniles on the same date. The prosecutor general's office in Alexandria alleged that the female protesters fought with guns and knives during October 31 clashes between Morsi supporters and Morsi opponents. According to Amnesty International, however, "the only evidence the prosecutor presented to court were two banners with the words 'anti-coup' written, some stones, and 25 signs bearing the image of a hand holding up four fingers." 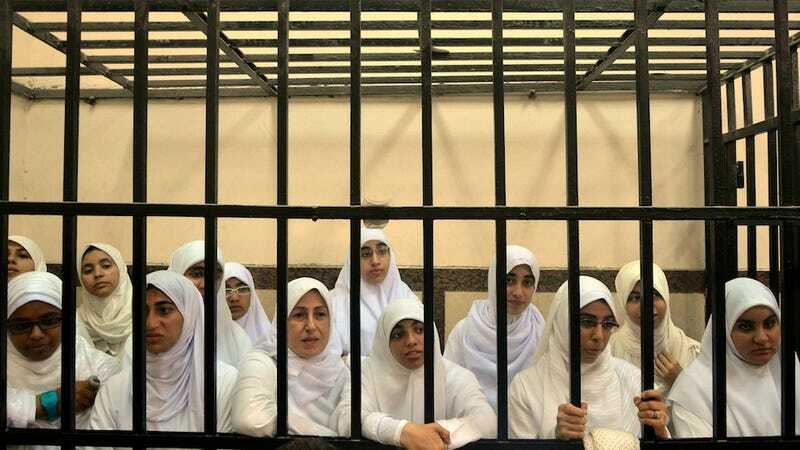 While the women were each sentenced to 11 years and one month in prison, the seven female protestors under 18 were placed in a juvenile detention facility, where they were to remain until they turned 21. "[The harsh jail sentences are] a strong signal that there will be no limit to the authorities' efforts to crush opposition and that no one is immune to their iron fist... These women and girls should have never been arrested. They are now prisoners of conscience and must be released immediately and unconditionally." Last week, an adviser to Egypt's interim president Adly Mansour said in as statement that the president would "issue a full pardon to the Alexandria females after the final judicial process is completed in accord to the constitution." It's extremely relieving to see an egregious injustice reversed after international pressure, but it's far from an indication that dissenters in the future will be treated fairly.